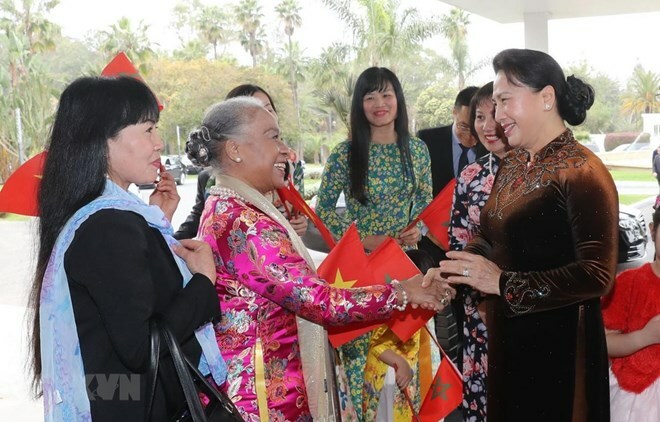 Rabat (VNA) – National Assembly Chairwoman Nguyen Thi Kim Ngan visited the Vietnamese Embassy and community in Morocco on March 27 after arriving in Rabat city to start her visit to the country. According to Vietnamese Ambassador to Morocco Tran Quoc Thuy, the embassy has worked hard to introduce Vietnamese culture as well as products through various activities in the country. Representatives of Vietnamese students in Morocco expressed their hope that the Party and State will continue designing preferential policies to attract Vietnamese students to return home to work. Chairwoman Ngan said her visit to Morocco is the first made by a NA leader in 14 years after NA Chairman Nguyen Van An’s visit in 2005. The visit aims to deepen the friendship with Morocco and the country’s parliament in particular. The NA leader briefed the Vietnamese community on Vietnam’s socio-economic and external relations situation, with GDP growth reaching 7.08 percent in 2018, the highest level since 2008. Vietnam has signed, implemented and negotiated many bilateral and multilateral free trade agreements and successfully hosted the second DPRK-USA Summit in late February, she noted. She lauded the efforts of the embassy in fulfilling its tasks, asking it to coordinate with relevant agencies at home, including NA bodies, on external relations. Recognising the Vietnamese community’s wish to contribute to the growth of the homeland, she affirmed that the Party and State always create optimal conditions for the Vietnamese community abroad to promote the national cultural identity and contribute to the motherland’s development.